Simple ways to protect your dock from pack ice damage and heaving winter lake ice. Ever since I moved out to Thousand Island country and was surrounded by lakes with pond owners or lake cabin owners with docks and boat cribs I have been asked about protecting docks from ice damage. What I have learned over the years about installing a simple do it yourself dock system is that there are many different systems available that do basically the same thing. The idea behind keeping ice away from the dock, boathouse or pilings is to reduce the damage caused by heaving ice floes and ice pressure buildup that can actually shift dock pilings and boat house structures resulting in some expensive repairs. I am often asked if it is possible to build or put together a cheap dock bubbler system and the answer is always "Yes!" 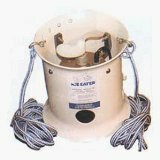 The sad part is that almost all cases of ice damage and dock damage are a result of negligence by eh owner or sheer laziness; installing a homemade dock deicer or dock bubbler is not really difficult but the key is to start preparing components and supplies early enough in the season, October or November, to not get caught without a viable system when the cold snap first falls and often surprises! The principal types of automatic systems for protecting marinas and docks from ice damage can be broken down into two main types: the submersed thruster or agitator and the dock bubbler. Agitators involve placing a heavy-duty submersible motor that drives a rugged propeller in continuous duty to draw warm waters from the depths of the pond or lake towards the surface. The warmer waters at the bottom of the pond usually maintain a temperature of around 4 degrees Celsius or 39 Fahrenheit and by bringing them rapidly to the surface in a directed thrusting stream they can keep large areas of open water even in the coldest of winter temperatures. I have seen this sort of ice-eater literally open up solidly frozen areas in only a few hours. This sort of deicer works best when you have deeper waters around the dock but keep in mind that even an agitator aimed at the shallow shoreline, if it originates in waters of say 12 feet deep, can create a large opening under the entire dock structure. The size of the opening in the ice depends on the overall ambient air temperature but typically even a 1/2 HP or 3/4 HP device can open up a hole in the ice up to 60 feet in diameter. When it is desirable to prevent ice damage in large marinas or yacht clubs over winter several units can be combined together to create a huge current that will open upon incredibly large amount of water. These units can either be suspended below the dock or pilings by nylon mooring ropes or can be attached to some sort of dock mount system. Several manufacturers, like Kasco Marine, offer high quality dock mount apparatus that allow you to strictly control the angel of attack of the deicer unit by using a graduated bracketing system. In shallow waters the most popular system is called a bubbler or a dock bubbler. 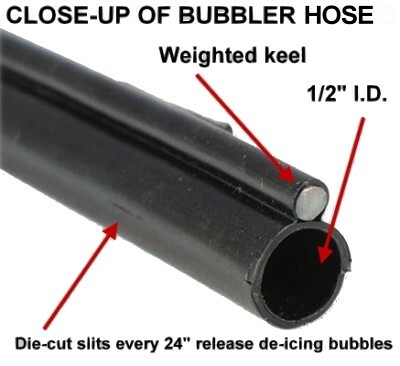 This sort of system involves an air compressor on the dock or shore mounted that blows air into diffusers or a diffuser line like a diffuser line, de-icing hose or bubbler line or deicer tubing which is a weighted perforated tubing that releases tiny bubbles down the length of the tubing. The long linear length of bubbles creates a constant movement of water and this steady flowing curtain of bubbles ensures that there is no ice formation along the dock structure or boat slips. Previous generations of weighted tubing were lead-lined stiff plastic PVC tubing with die cut slits ever 12 to 18 inches. I have found this tubing to be susceptible to kinks and ruptures not to mention the lead metal keel that was designed to keep the tubing on the pond bottom actually used a poisonous metal which has since fallen out of favor with anyone concerned about the potential health effects of heavy metals in our water. Newer developments in diffuser tubing have seen improvements in efficiency and safety by using all PVC diffuser tubing that contains zero metals. PVC is a polymer of vinyl chloride and is insoluble in most organic solvents. Such diffuser line, de-icing hose or bubbler line, being constructed of vinyl resins, which are used in soft flexible films for food packaging and in molded rigid products, such as pipes, fibers, upholstery, and bristles, is a more environmental choice. Plus, the ability of such new diffuser tubing to remain flexible in cold temperatures makes it's use as a deicer tubing much more practical. Our deicing experts have years of experience with design and installation of bubblers and de-icers in mining, stormwater, gas and oilsands and tailings ponds, ski hills, municipal docks and marinas and dam deicing and pumphouse deicing. Using the most efficient systems we can design or recommend the ideal deicing or bubbler system for any job, large or small. A clear and concise website offering unique systems and custom designed dock protection systems. Good supply of information and our review teams found the information was presented in a professional manner. Large and small systems were presented with examples of how they would personalize a system based on client needs. Large scale de-icing and industrial aeration systems are their specialty. Also an authorized Canadian Kasco Dealer. Using diffuser line, de-icing hose or bubbler line to Keep your dock free from ice We recommend two different types of systems to prevent ice from forming around a dock a "dock bubbler" type or a submersed motor type; one uses a length or several lengths of air diffusing diffuser line, de-icing hose or bubbler line under or around the dock to circulate the deeper warmer water. A low cost compressor on the dock or nearby feeds air to a length of diffuser line and the rising boil of active bubbles bring warm water to the surface where it keeps ice from forming. Even a small linear compressor, which consume very little electricity, can produce enough air to create an active circulating movement under your dock due to the low operating pressure of our new air diffusion tubing.